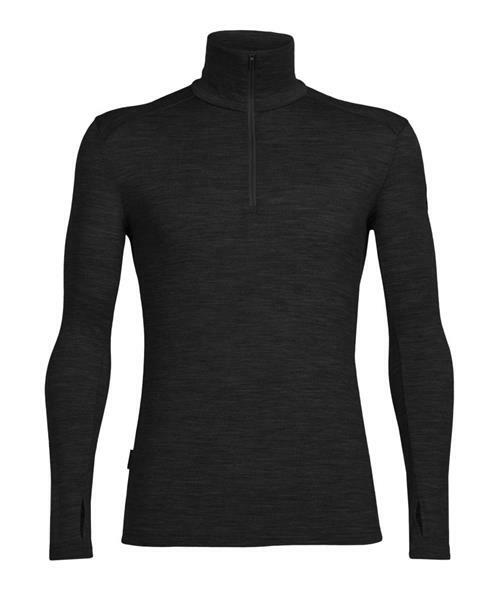 Icebreaker's midweight 100% merino baselayer for the coldest days of the year, the Men’s Tech Top Long Sleeve Half Zip features their 260gm BodyFit fabric for bone-chilling temps on the ski hill, the trails or around town. The updated slim fit optimizes layering performance and next-to-skin comfort, and the added offset shoulder seams and forward set side seams to reduce chafing when you’re wearing a pack or moving fast. The half-zip design also makes for easy temperature regulation during high-output days or variable temperatures. Tech Top LS Half Zip - Mens is rated 4.6 out of 5 by 25. Rated 5 out of 5 by Outdoorsman89 from First Test I ordered a few pieces from Icebreaker online a few weeks ago. I got to test the 260g Long Sleeve Half Zip on a spring camping trip, in Northern Ontario, last weekend. We had a mix of weather, but it was 10 degrees with light rain on the second day. I was very pleased with how this shirt preformed, it kept me warm, even while wet. I'm looking forward to using my icebreaker gear for work and hunting next fall and would definitely recommend it to anyone doing a lot of outdoor activities in potentially cold and wet environments. This stuff isn't cheap, but it's very well made and works well. Rated 5 out of 5 by weekender from Dressing up Living in a climate that's has an extended winter season I enjoy the comfort and unstructured fit of merino either whether at work (in the office) or at play (outside). I can wear this shirt in either setting. It's super breathability and comfort makes it the perfect choice for either application. Why have to decide? Under a suit jacket or with casual slacks, it's my go to! Rated 5 out of 5 by Jager from Toasty Warm This long sleeve is amazing, I've used him in cold weather camping up at Algonquin park and it held up to my expectations. I am 180 pounds 6'1" and I got the medium. I wanted to try them on first but I had no time before ordering them. The medium fits snug to my skin.